Like most of Motorola’s lineup, the Bionic uses Qualcomm’s MDM6600 for CDMA2000 1x and EVDO (3G) connectivity. There’s nothing out of the ordinary about that at all, and again MDM6600 is a combination HSPA+ (HSDPA 14.4, HSUPA 5.76) and CDMA2000/EVDO Rev.A baseband and transceiver. 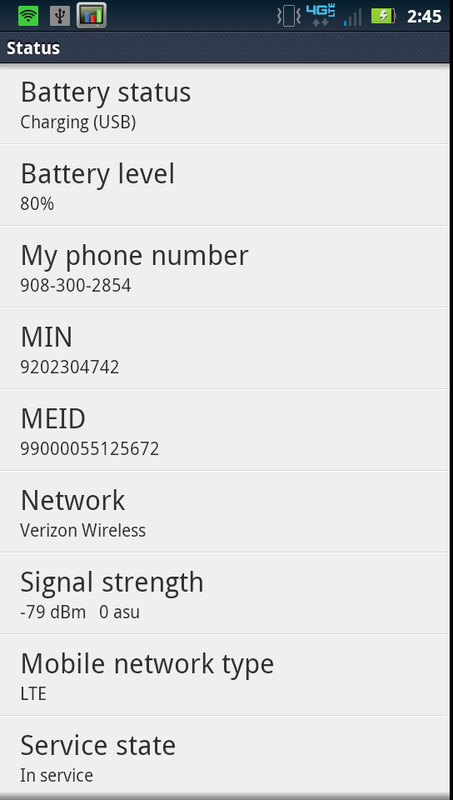 In the Bionic, only CDMA2000 1x/EVDO is used, on both 850 MHz and 1900 MHz, but more on that in a moment. I started out by looking at the FCC internal photos which are of marginal quality, and then the iFixit disassembly photos which are much better. What’s unique about the Bionic is that it uses a Motorola LTE baseband for LTE, instead of MDM9600 which would also be a logical choice. To date, we’ve seen QCT’s MDM9600, LG’s L2000, and Samsung’s CMC220 providing LTE in respective smartphones. So what about this Motorola LTE modem can we glean? Unfortunately, there’s not a lot out there. The chip is silkscreened with the Motorola logo, and LCM2.0, and it appears like “T6VP0XBG” is another part of the name. Search any of this and you’ll find nothing more than speculation and recursive levels of confusion. Motorola also declined to comment about this particular part. 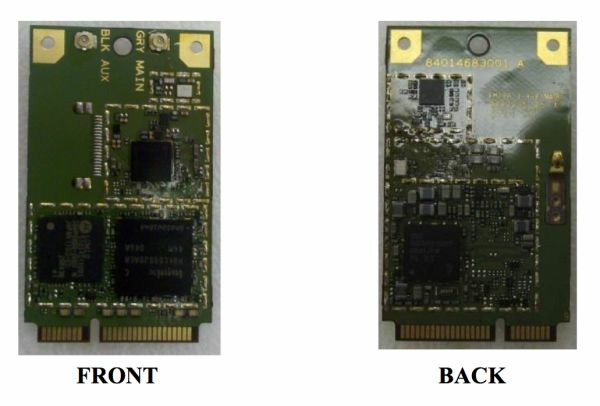 Adjacent to the Motorola LTE baseband is a Hynix combo 2 Gbit NAND and 1.8V 1 Gbit LPDDR1 DRAM, marked H8KCS0SJ0AER. This is undoubtably for the LTE baseband, as it’s standard fare for each of these to have their own MCP DRAM and NAND. Look above and you’ll see a smaller one (also H8) Hynix adjacent to MDM6600 which we’ve seen over and over. To the right of the LTE baseband is an undocumented Intel/Infineon transceiver, and then further to the right, a part with Skyworks markings which is almost without a doubt the 700 MHz power amp. Then to the far right you can see two gold pins which mate up with the antenna board that attaches there. You can see where the Tx antennas are for WLAN and CDMA/LTE from the FCC docs. WLAN is off to the side, CDMA/LTE seem to be integrated into one module at the bottom, which is pretty standard. The WCDMA/GSM network functions have been disabled by the firmware and are SIM locked by all US operators on this product. 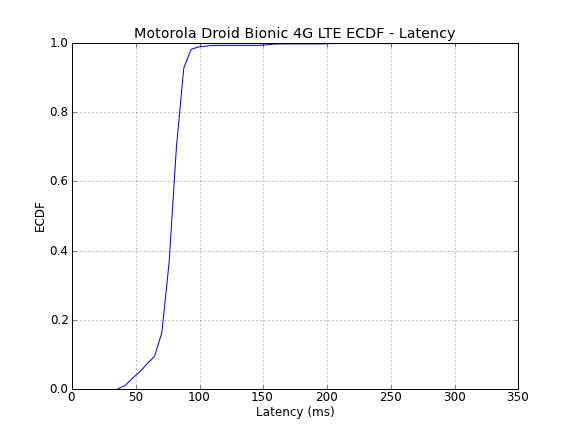 I would not be surprised to see a Droid Bionic Global with LTE, EVDO, and WCDMA/UMTS support some time in the future. I’m unsatisfied with just reporting that some part exists, so I poked around. 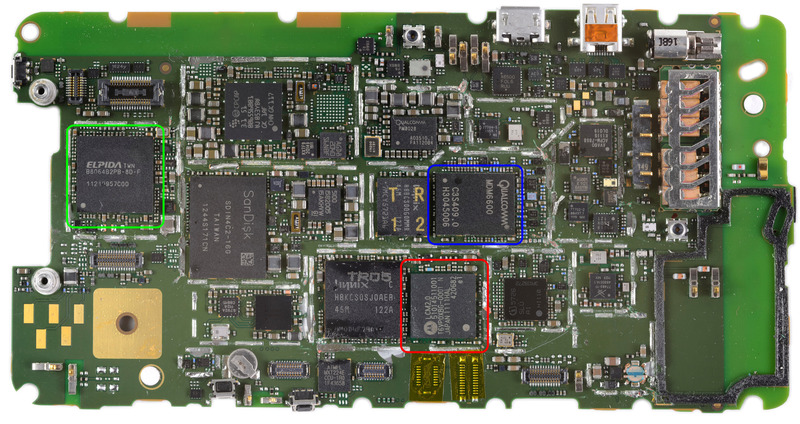 Delving deeper by poking around inside the Bionic’s /system folder, I uncovered that this baseband actually has a name - it’s Motorola’s codename Wrigley LTE modem, which works like an ethernet over USB (communications device class) device. Interestingly enough, the Droid 3, Bionic, and Motorola Xoom kernels all include the Motorola Wrigley Modem Controller driver. Inside the Bionic are also a few bash scripts that dump wrigley-specific debugging data including some statistics. The next logical question is what LTE UE category codename Wrigley is. We talked about this in our Verizon 4G LTE piece, but UE category essentially is analogous to the UE category from HSPA - it defines the theoretical maximum throughput in Mbps. 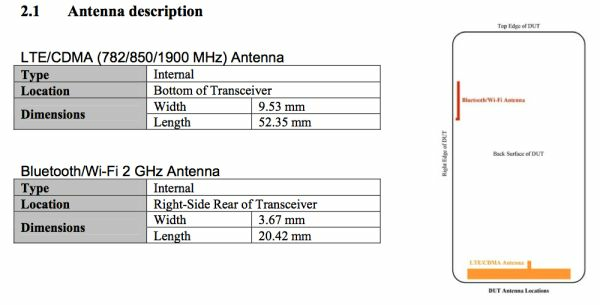 The FCC documents are usually a good place to start, however in this case they list UE Category 1, which is completely wrong. You can however tell that it has 2 Rx chains, and 1 Tx chain, just like every other LTE smartphone. After poking around with the debug scripts on the Bionic, I was able to find what I believe are SNMP MIBs which relate to Wrigley’s configuration. You can see references to object identifiers (OIDs) just like you’d expect for an SNMP configuration, and further, given that Wrigley is apparently an ethernet over USB device, this configuration route makes sense. 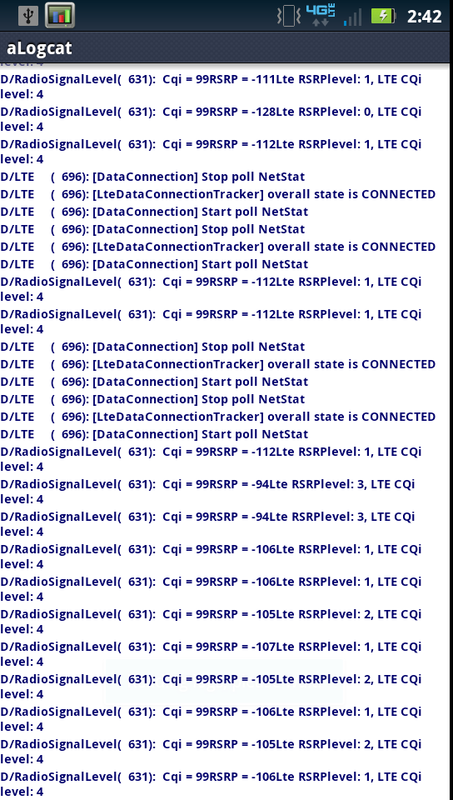 There are 14 configuration files, some of which include some logging and debug, and only one that mentions LTE. 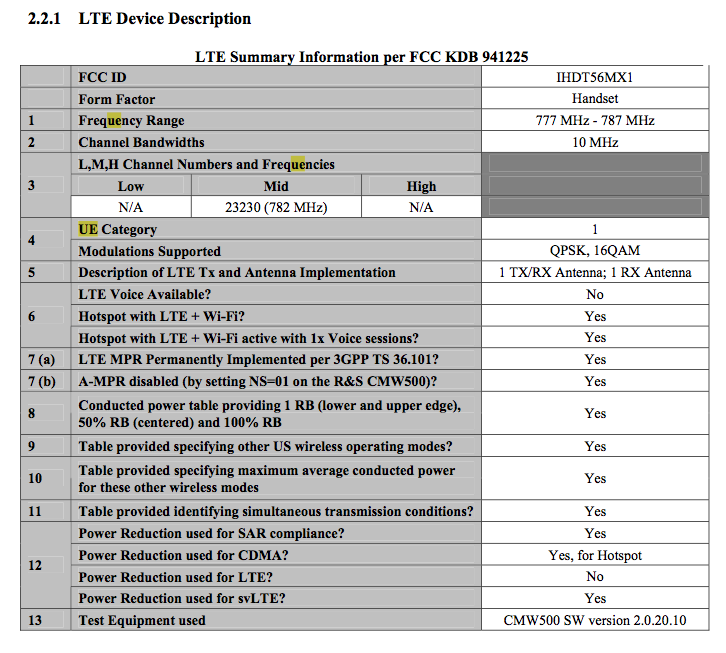 So there we have it, Wrigley is very likely UE Category 2 for LTE. The fact that it is configured to work on EARFCN 5230 is telling, as this corresponds to LTE Band 13 precisely, which is exactly what Verizon uses for LTE. 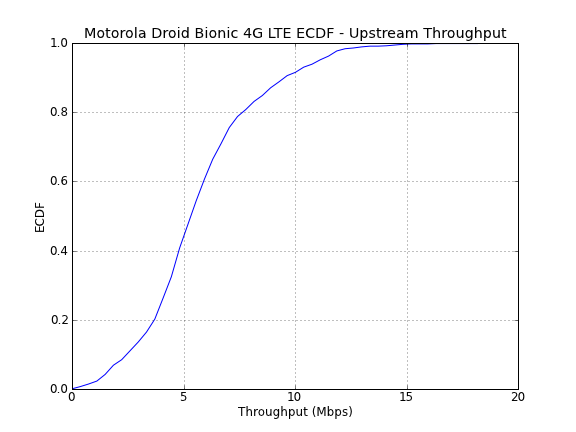 As a reminder, all the LTE devices we’ve seen so far are UE category 3, which corresponds to a maximum theoretical throughput of around 73 Mbps on the downlink. Before we leave Wrigley entirely, I should conclude my mention of the Motorola Xoom. For those interested, I did some poking around and found that the Xoom’s LTE module is based on this same exact baseband. It’s immediately visible on the FCC’s internal photos, and as I already mentioned has drivers and references in the Xoom’s kernel. That brings me to throughput, which we’ve measured on the Bionic just like every other smartphone since I’ve started doing this. I run a ton of speedtests, gather some data, and create histograms showing the distribution for throughput (downstream and upstream) as well as latency. I did this just on 4G LTE on the Bionic since EVDO is well understood and not really worth exploring much anymore. For the Bionic, I ran a total of 938 tests in my own market in Tucson, AZ, in Phoenix, AZ, and some in Anaheim, CA, and generated those plots. A few people have also asked me to make empirical cumulative distribution functions (ECDF) plots of the data as well, so I went ahead and made those in addition to the normal histograms. First up is downstream, where the average is 15.9 Mbps, with a maximum of 39.1 Mbps. I’ve tried hard to get close to 50 Mbps but couldn’t hit it. Next is upstream, where I saw an average of 5.7 Mbps up, and a maximum of 18.1 Mbps. 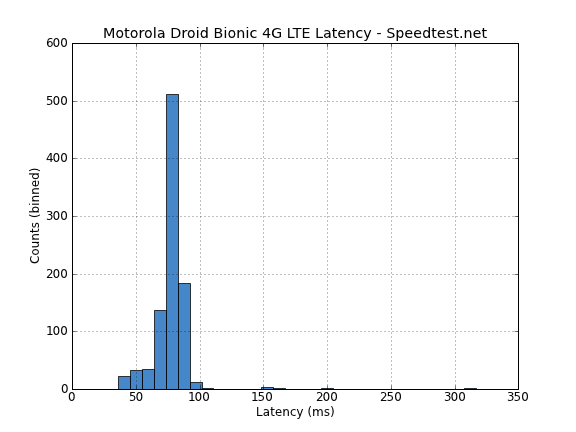 Latency is pretty low on the Bionic, minus a few strange outliers, with an average of 77ms, and a minimum of 36ms. 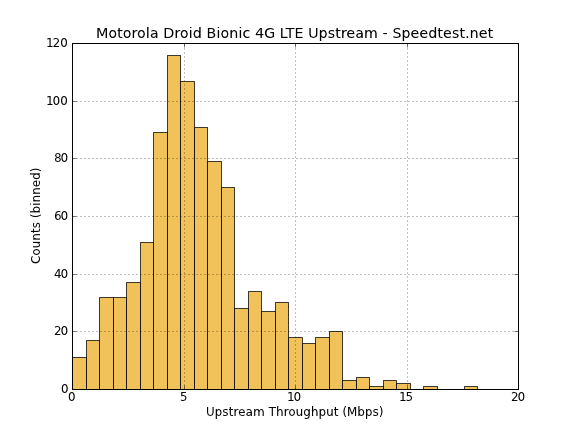 For supposedly being UE Category 2, the Bionic posts speedy results that seem completely in line with what I’ve seen on other UE Category 3 4G LTE devices. I’m not sure whether I just haven’t been able to test the Bionic in a situation where it could go faster but was otherwise limited, but I wager most people won’t be able to tell the difference. I’d like to reiterate that LTE simply needs to be experienced to be fully appreciated. Were I blindfolded (and in a good signal area) I would have a very tough time differentiating between LTE and a decent wired connection. 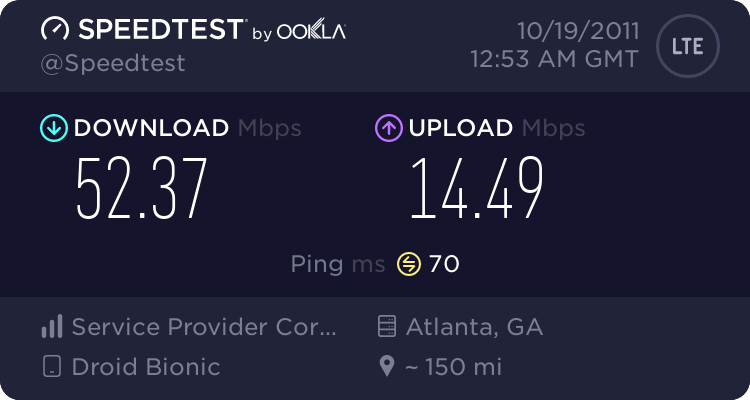 I played a few rounds of the BF3 beta (for science, of course) over the Bionic while tethered over USB, and found latency almost indistinguishable from my cable connection. It’s a dramatic difference from EVDO in both latency and throughput, one that’s shocking if you get pushed back to EVDO. The Bionic also is the first device (to the best of my knowledge) that reports 4G LTE signal bars based on channel quality in addition to just received signal strength. Devices like the Droid Charge and others can be somewhat misleading and just report the bar visualization based on signal strength. 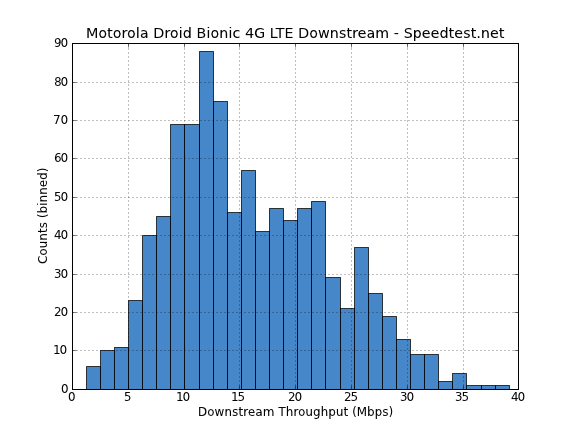 It took me a while to figure out how to actually get to the Bionic’s 4G LTE signal metrics, as it isn’t the number shown in “About” - that’s actually just what’s reported from MDM6600 for EVDO or 1x. If you run logcat, you can see actual signal information being reported which in turn is used to paint the appropriate number of bars up at the top using RadioSignalLevel(). In the case of the Bionic, the two figures of merit used are the RSRP Reference Signal Receive Power, and CQI Channel Quality Indicator. The phone reports a number from 0–4 for both in addition to just the raw number, and the minimum of these two is the number of “bars” shown, eg min(RSRP,CQI). The result is that this is a much more realistic and practical visualization than most others I’ve seen, and you can also just run alogcat from the Android market, filter by LTE, and see this information in real time. Finally, I didn’t experience very many stalled data sessions on LTE or other connectivity problems. This of course varies on a market to market basis depending on your coverage characteristics, but in contiguous coverage settings I saw no problems with the Bionic stalling outside the normal one or two seconds to handover between cells. 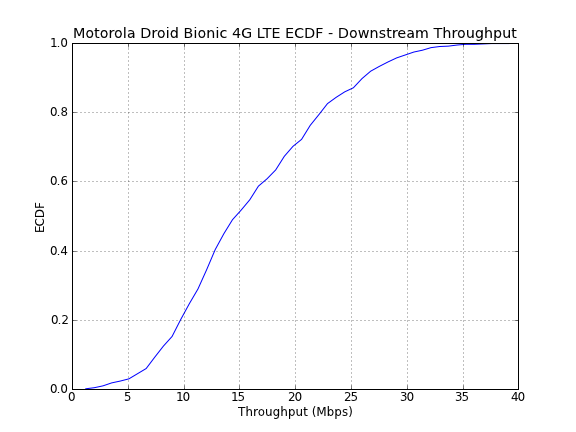 In addition, the Bionic seems to cling onto LTE even down to –115 dBm before falling back to EVDO, which minimizes the number of slow or frustrating handovers. Again, for LTE the real figure of merit is SINR (Signal to Interference + Noise Ratio) which is reported in a bit of an ambiguous manner on the Bionic using CQI. 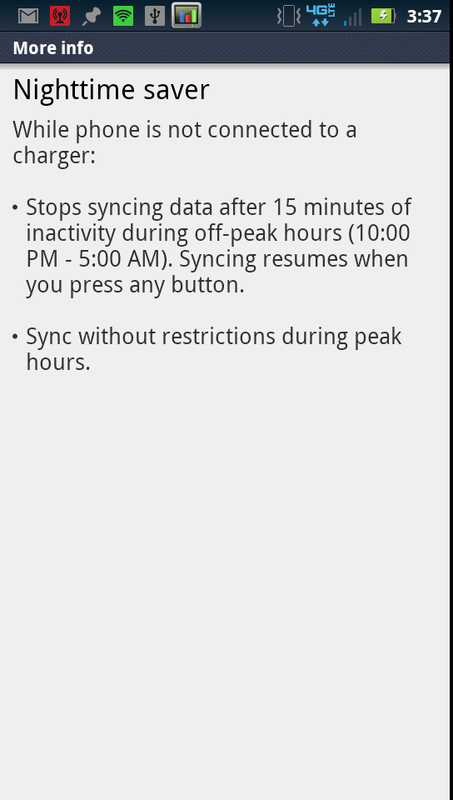 I’ve also read some confusing reports about LTE data pausing for long periods and suspect this is just confusion which arises from the default battery mode setting - nighttime saver - which stops account synchronization between 10 PM and 5 AM. 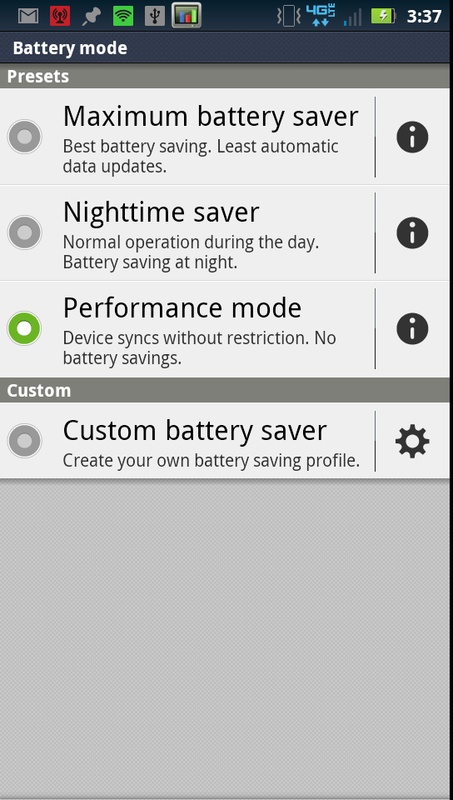 Motorola sets this by default on all its devices, and I don’t think most people realize it. I always end up setting this to maximum performance and use a charger next to my nightstand. Thanks for the thorough review. It's wonderful to have more in-depth looks at device performance and comparisons to the competition. The HTC Rezound is giving me very bad trouble with the hotspot and staying connected to LTE.